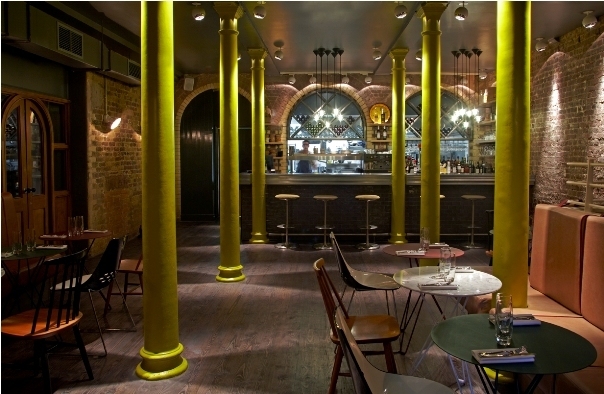 Baranis is one of two Provence inspired openings on Chancery Lane within the month. Is this an utter coincidence or part of a sly takeover bid from across the channel? Well, neither actually. Baranis bar has the same owners as Cigalon restaurant above it in the old Hodgson’s Wine Bar building, but that’s where the similarity ends. The two are not visibly joined and must be entered through separate doors. Whilst Cigalon is about fine dining, Baranis is about cocktails, snacks, socialising and petanque.Essentially the same as boules, petanque requires players to throw their metal balls along a gravel court in a bid to get them closest to the smaller ‘jack’ ball. A popular game in France, Baranis can boast the only indoor Petanque court in the UK. It’s much more exciting than it might sound, especially after a cocktail or two when things (speaking from experience) can start to get a bit competitive. Besides, the old brick walls contrasted with bright lime green are inductive of a feeling of a fun.During game nibbles, between game snacks and full seated meals are all available, with the strictly Provencal menu spanning squid escabeche; wild mushrooms with polenta and chestnut; cockles with fennel; and a fairly exciting selection of cheeses along with more snacky cured meats, olives, chips and freshly baked breads.Prices that predominantly range from £2 to £6 for small dishes mean there’s money left over to indulge in some drinks. Thyme daiquiris, rose mojitos and gentiana Champagne cocktails offer some interesting combinations which draw on the fragrances of the region. For oenophiles the impressive vaulted wine cellar offers all you could ever want from Provence and other parts of France, with prices ranging from the reasonable (£19) to the silly (£650) for splash-the-cash City types or perhaps those good at doing a runner.Baranis is at 115 Chancery Lane, WC2A 1PP (map) and is currently open for lunch, dinner and everything inbetween from Monday to Friday only. Visit the website for more details. We’ll give you our verdict on Cigalon directly above shortly.